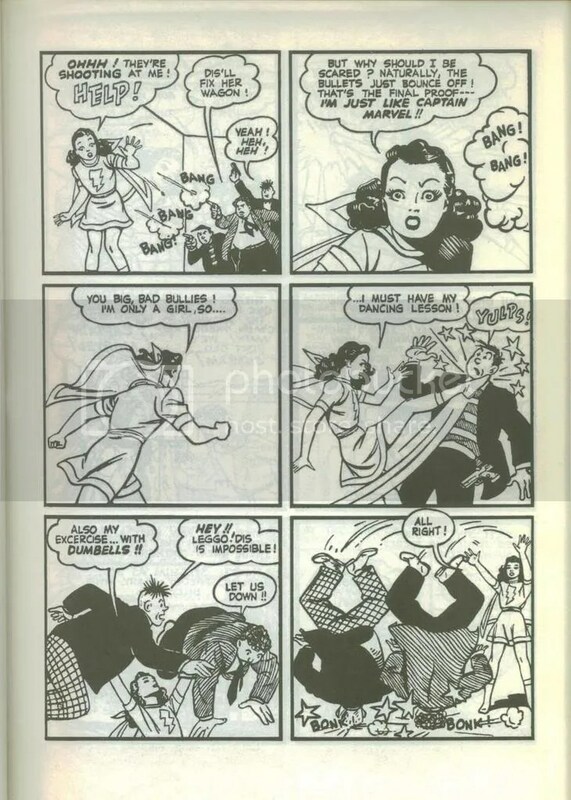 So … who thinks Mary Marvel needs the black cheerleader outfit to be tough? … and here she is in July-August 1975, showing that experience doesn’t mean sacrificing one’s sense of humor. 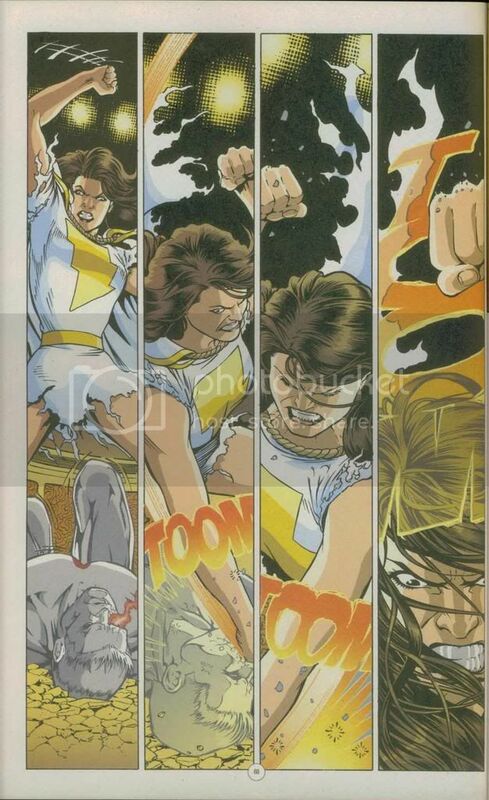 … and a mind-controlled Mary Marvel throws down on Captain Atom! First, an anniversary — today marks 10 years of practicing law, all of it in Kentucky. I hope that when the results of this July’s Virginia bar exam come out, I’ll be licensed to practice law there too. Less talk, more comics! Batman #639 (written by Judd Winick, with art by Doug Mahnke and Dustin Nguyen) ostensibly begins a new storyline, but really it just continues the mystery of the Red Hood. See, Winick’s first issue started with Batman unmasking the Red Hood, and everything else proceeding in flashback. I liked that device, because it meant we’d work up to the unmasking. However, this issue Bats behaves as if he knows who the Hood is, but to the best of my knowledge we’ve never put the unmasking in any kind of timeline. Anyway, everybody’s still around except Nightwing, who’s been replaced by Onyx in the story structure. Batman also has some post-Identity Crisis moments with Zatanna and Green Arrow, in which Winick manages to make Batman arrogant, antagonistic, and sympathetic. While I like what Winick is doing with the book, I hope he wraps up this “new” arc fairly soon. 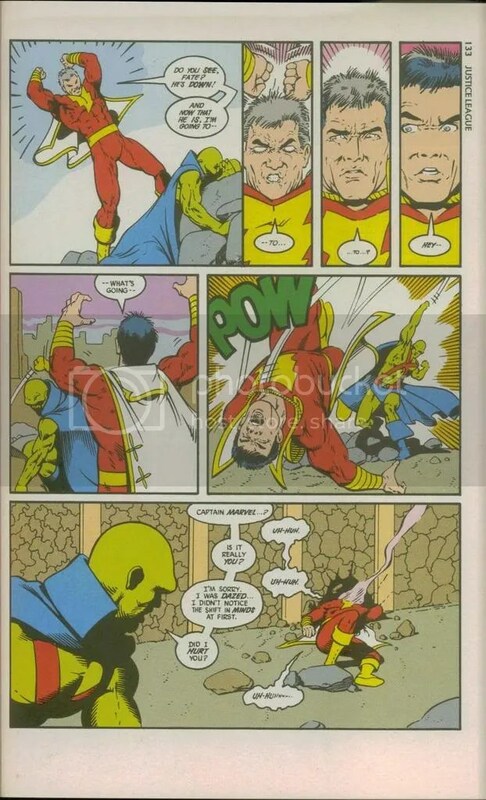 Winick also writes this month’s Adventures of Superman (also #639), continuing the Captain Marvel/Eclipso story (art by Ian Churchill and Norm Rapmund). Superman fights an Eclipso-possessed scientist who’s stolen a Kryptonian battlesuit. She wants him to get mad enough for Eclipso to possess him, but he knows that — probably because this plot was used 13 years ago in the summer crossover series Eclipso: The Darkness Within. Based on that alone, this story still hasn’t convinced me it needs to be told. Anyhoo, because this is Part 2 of 3 and Captain Marvel still has to beat the tar out of Supes, I’m sure you can guess how the issue ends. My only question is, does Lois usually type in her underwear? Flash #221 (written by Geoff Johns, with art by Howard Porter and Livesay) gives us part 2 of “Rogue War.” I liked this issue more than I have recent Johns issues, mostly because it has a fair amount of Flash in it. While Johns shows the dueling Rogues’ power, he also conveys the extent to which their individual battles are devastating Keystone City. There’s terse first-person narration and armchair psychology, but it all seems to work together. I don’t remember if I noted a Reservoir Dogs influence in Johns’ approach, but he comes closest to that in this issue. Wonder Woman #215 (written by Greg Rucka, art by Rags Morales and Michael Bair) starts a new arc with Diana, Wonder Girl, and Ferdinand headed to Hades on a mission for Athena. Rucka’s script is efficient and entertaining as always. The Morales/Bair art is more three-dimensional than the book’s usual team, and I was reminded (surprisingly) of Kelley Jones. Given the issue’s subject matter, that’s not inappropriate; and overall, the book hasn’t skipped a beat. Legion of Super-Heroes #5 (written by Mark Waid, art by Barry Kitson and Art Thibert) delivers a full-length tale of the Legion struggling against its evil — or possibly just more pragmatic — counterpart. I wasn’t sure exactly who they were or where Waid is going, but I liked the spotlights on Lightning Lad, Saturn Girl, and Timber Wolf; and so far the book seems headed in a good direction. Captain America #5 (written by Ed Brubaker, with most art by Michael Lark and a few pages by Steve Epting) focuses on Cap’s World War II days to give us some background on today’s menace. Along the way we discover the startling secret of Bucky Barnes. David Welsh (and I’m sure many others) have written about the Buckster, and I agree with them that while it is startling, it also makes a certain degree of sense and even gives Bucky a bit more depth. You can’t say that about a lot of retcons, so hats off to Brubaker. Lark does a fine job with the issue, and he and Epting complement each other well. Finally, Star Wars Empire #30 (written by Kaare Andrews, with art by Adriana Melo) continues the compare-and-contrast Luke/Anakin arc. Although this issue went a long way towards explaining why the people of this planet hate heroic Jedi Anakin Skywalker, and by extension Luke, I was still confused by the artwork. Leia especially looks like someone grafted Carrie Fisher’s face onto a taller, more zaftig body. I may drop this book after the arc is over, but it comes out so irregularly I can’t say when that would be.